Lesson: The Derivative | Calculus | Math Tutor Inc.
Our Introductory Calculus tutorial software program contains over 40 topic areas. One of them is The Derivative, and this page summarizes the main ideas of this topic. This page is intended for review, and is not a substitute for the interactive, self-paced tutorials of the MathTutor introductory calculus software program. In this lesson we wil learn about the DERIVATIVE, one of the most important concepts in calculus. One of the goals of calculus is to measure the rate at which quantities are growing or changing. More precisely, we want to determine how much one variable will change in response to a change in another variable. Here's another way of saying it: Let's say the variable 'y' is a function of the variable 'x'. If x changes by a certain amount, say Δx, then y will change by an amount Δy. The ratio of the change in y (which is Δy) to the change in x (Δx) tells us the rate at which y changes in response to a change in x. Let's consider a case in which y is a linear function of x. In this case the graph showing the relationship of y and x is a straight line. 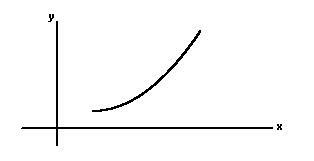 The steepness of this line is a measure of how quickly y changes in response to a change in x. Another name for the steepness of a straight line is SLOPE. Slope is defined as the change in y divided by the change in x. If the slope of a straight line is 3, this means that if x is increased by one, then y will increase by three. A straight line has constant slope at all points along the line. So regardless of the value of x, y will change at the same rate with respect to x. But what about cases where the graph of x and y is not a straight line, but is a curve? How do we measure the steepness or slope of a curve? Look at the graph below. We can see that the slope of the curve is different at different points. is read "the limit as Δx approaches zero". The slope of the function y=f(x) at the point "x" is called the DERIVATIVE. It is also commonly written as dy/dx.